Regardless of the type of event you have coming up, décor printing is an ideal way to spice up your venue. No matter the type or size of the event, Bombshell Graphics can handle all aspects of your event printing needs. We can create banner frame props, table covers, social media cutouts, and photo booths, which are effective when it comes to creating more joyous moments with your guests. Many individuals use our services for birthdays, weddings, anniversaries, graduations, reunions, corporate events, press conferences, and other special events. Whether you have your own designs to use for your event or need help creating a design concept for your event, we can make this an easy process. Coordinating what printed materials you will have helps with the overall look of the special event. Printed materials often add to the overall theme of your party and help accentuate the decorations. For example, print materials such as menu cards, programs, place cards, and table numbers can all match the theme of your special event! Having plainly printed materials can actually take away from your events overall decoration, so it’s ideal to have everything match. Special occasions such as weddings, bar mitzvahs, and quinceaneras all have different themes and printing needs. Elements such as invitations, place cards, and napkins can be printed to your event’s theme. If you are looking for a template or a fully customized design for your printed material, our team at Bombshell Graphics can bring your vision to life. If you need banners in different colors, window clings graphics, or a completely unique and customize event print job, we’ll be able to facilitate. To make your special event stand out from rest, have Bombshell Graphics create an awe-inspiring design for your special day. There is more to event decoration then having a centerpiece placed, floral arrangement set, and dressing up the venue. It’s all in the details and accents when it comes to decorations. If there is a specialty item with sentimental value or a non-traditional item you want to be decorated, we can print it at Bombshell Graphics. Here are some of the specialty items we have decorated for our clients. 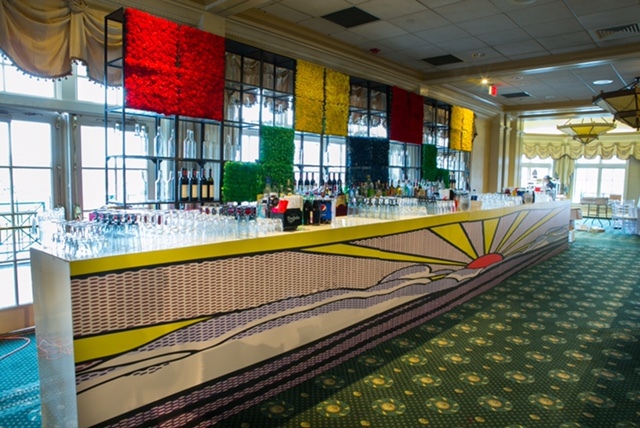 If you are looking for a specialty design to add to your event’s décor, look no further than Bombshell Graphics. We take your initial concept and bring it to life. Our design team will be able to create custom event graphics, decals, and wraps that are the perfect décor for your special day. To place a design order for your special occasion, give us a call at 862-210-8408 or fill out our form here. We offer decor printing in Boston, New Jersey, Connecticut, Delaware, Hartford, Long Island, Massachusetts, New York, Pennsylvania, Philadelphia, Rhode Island, Virginia, Washington DC, Westchester, and nearby areas.